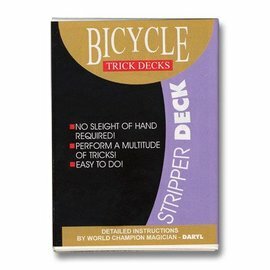 Stripper Deck w/Book Kit - Bicycle You Save $1.00 buying this as a kit. A card is selected and returned to the deck. 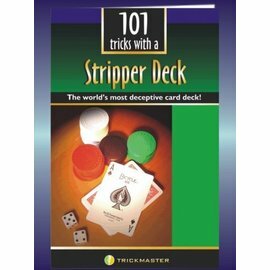 The magician then lets the SPECTATOR shuffle the deck completely losing their card in the middle of the pack. The deck is then handed back to the magician who cuts the cards one time and the selected card magically rises to the top of the deck! The card is then placed back in the middle of the pack and shuffled again by the spectator. Magically the magician takes the pack and removes the spectator's selected card right out of the middle of the deck! This effect can be immediately repeated with a different card! Perform incredible feats of card magic which will make you look like a professional sleight-of-hand artist in just minutes. 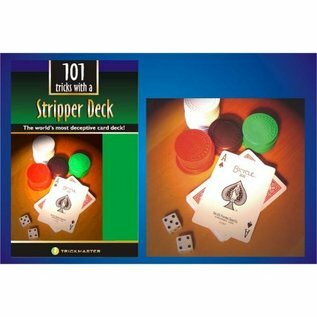 The routines and suggestions within this booklet will help you to perform like a professional without learning any complicated sleight-of-hand. Use the special secret of the Stripper Deck to: magically separate an entire suit from a fully shuffled deck, Use your incredible sense of touch to feel and identify the spectator's card, instantly find any card that has been hidden and shuffled into the deck, communicate with invisible spirits that will report the selected card's location, mentally force a group of people to think that they all selected the same card and perform many other amazing feats!